We pick up on April 10, 2013, at 10 pm with Dr. Han being nervous and hyung calling him to warn him about his new memory that 1993 Choi has a picture of Sun-woo. But Sun-woo has already set his watch for 30 minutes and lit the incense. Exactly twenty years in the past, Choi is showing the CCTV picture to hyung and saying they have to get rid of this guy. Back in the present, his co-workers find him on the floor, wet, in a pool of blood. The news goes on without him while the staff speculate about Choi being behind it. A friend who goes in the ambulance calls hyung, who tells them to check for water in the lungs. 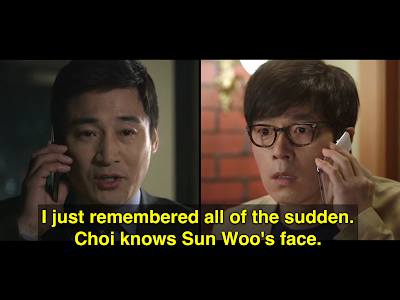 When Dr. Han calls, Sun-woo is able to tell him that Choi knew his face and is doing different things from before. Present-day hyung agonizes through new memories of himself talking to the minion and being afraid to confess. However, as Sun-woo is being wheeled into the OR he is able to report that his young self is heading into the police station. As a result of Sun-woo taking his mother to an optical shop that had security cams, Dr. Choi now has his picture and is acting differently than before. Such as hiring a hit man. However, he does not remembering everything or realize there is an alternate timeline.